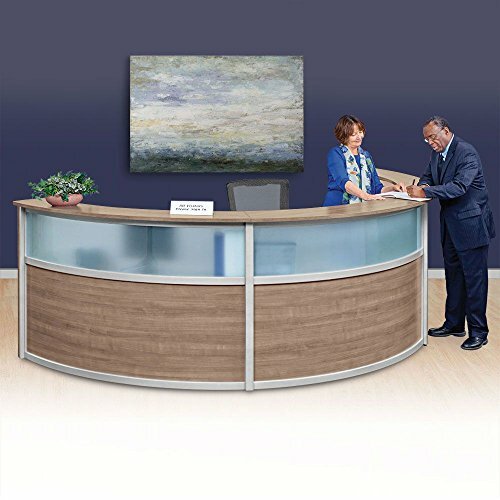 Make an elegant impact in your lobby with the Compass curved reception desk. This triple reception desk will allow you to effectively help guests easily as they enter your space. The curved shape, glass panel and silver accents make this desk functional and sophisticated; The Compass triple reception desk features laminate work surfaces that will resist scratches, stains and spills. A frosted tempered glass panel and silver painted accents add visual appeal. Three people can easily work behind the counter with the generous space. Stay connected easily with the power ports conveniently found right on the desktop that features two AC outlets and two USB. Marque Curved Reception Station - 69.5"W x 33.5"D Cherry/Silver Accents Dimensions: 69.5"W x 33.5"D x 45.5"H Weight: 120 lbs. Marque Five Piece Reception Station with Plexi - 142"W x 128"D Cherry Finish/Silver Accents Dimensions: 142"W x 128"D x 45.5"H Weight: 599 lbs.